After a busy morning dodging thunderstorms both in Chicago and Omaha I got in the hangar for some work. I knew I would only have a few hours between office work out at the airport and game six of the Stanley Cup (let’s go Hawks). I had the left elevator all assembled and matched drilled a few days ago. So next was to disassemble it all and treat the edges, deburr all the holes, scuff the surfaces and dimple/countersink where required. All those tasks were completed except for the countersinking of the trim tab spar. That spar has dimples on the bottom flange and countersinking on the top flange. That’s due to the trim tab hinge being attached to the bottom side of the top flange of the spar. This is a sandwich of sorts, the skin on top, the spar flange in the middle and the hinge on the bottom. If you dimple the flange they would not allow the hinge to sit flat. Unfortunately I didn’t realize this until I read ahead. But at that point I was mr. speedy working with my pneumatic squeezer and had already dimpled both the top and bottom flanges of the trim tab spar. So I thought I would be ordering a new part from Van’s. 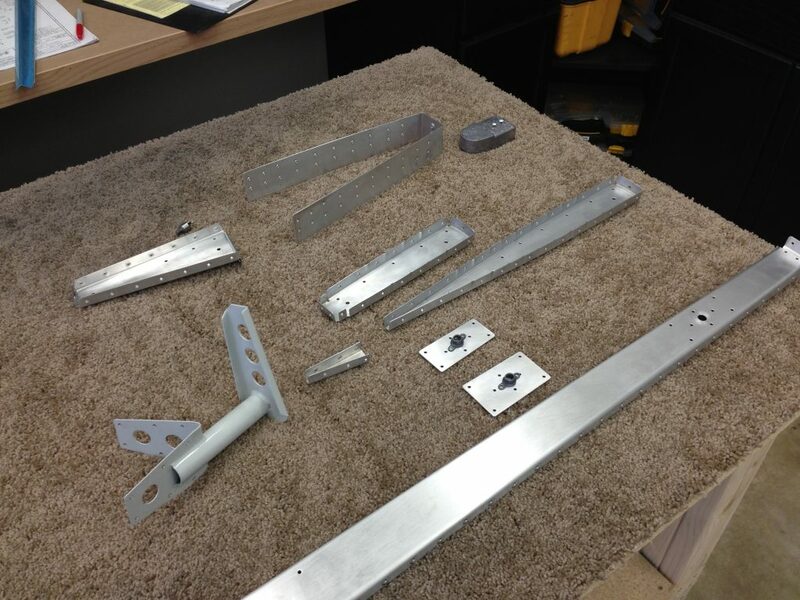 So I grabbed the MacBook and loaded up www.vansairforce.net and did a search for the trim tab spar. What do you know I’m not the only novice builder that has made that mistake! After a little bit of reading I found that it would be perfectly acceptable to use my pneumatic squeezer and my no hole yoke/flush set and flatten the dimples. You can do this once without to much distortion of the metal. So I figured this would be a great time to call it a day, after making a mistake(and a severe thunderstorm warning rolling through my area). So I cleaned up the hangar and pulled the truck inside. 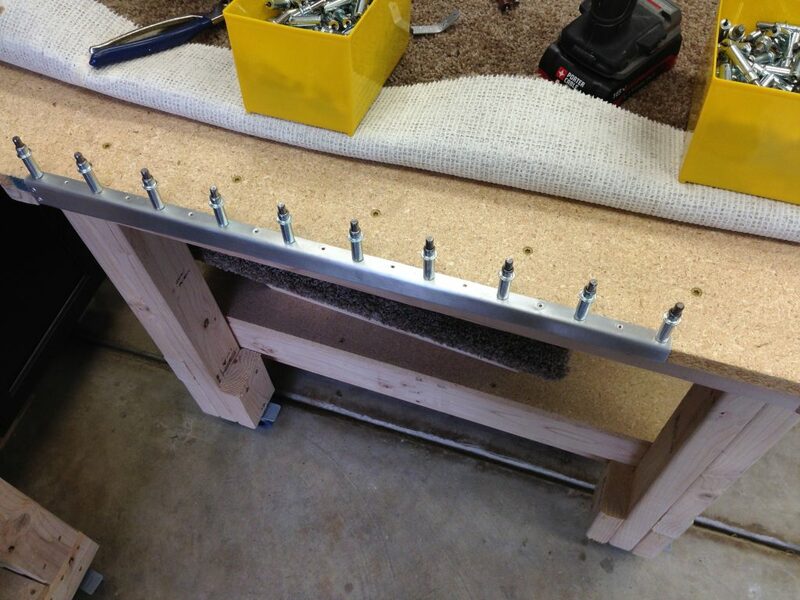 While cleaning up I decided to drill a couple of holes in the workbench to hold the trim tab spar. The spar is fairly thin metal and when you countersink thin metal the hole gets enlarged a little. That larger hole will now let the guide, which is the size of the rivet, wander causing chattering and a bad countersunk hole. To prevent this I’m going to use wood as a backer on the flange of the spar. I will drill holes through the holes of the flange into the wood matching all the holes on the spar. This will allow a hole for the countersink guide to stay centered and make a nice countersink. So that’s all for today, I fly a day trip to Minnesota tomorrow and will get some time in tomorrow night.